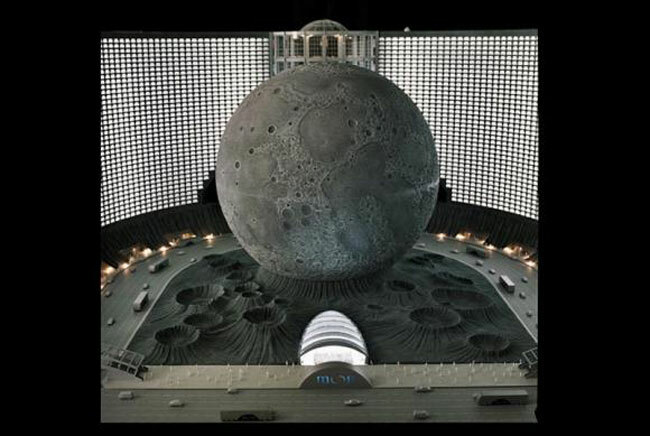 Just when you thought Vegas had it all, did you know we were supposed to have The Moon and Titanic, too? While we do have a planetarium and a Titanic attraction, the hotel versions never made it to the Las Vegas Strip. These are just a couple of the botched — yet interesting — Las Vegas Vegas hotel ideas. But imagine if every concept succeeded. What would the Strip look like? Do you think you’d like it more? Would it change your perception of it? You’ll find yourself answering these as you read through our list of hotels that never were. Bonus: We’ll also share our favorite fictional Vegas hotels that looked so glamorous, we wouldn’t blame you if you thought they existed. Pack your imaginary suitcase and check out (or shall we say check in to?) these intriguing hotel visions. Fontainebleau’s exterior. Photo courtesy of VEGAS INC. 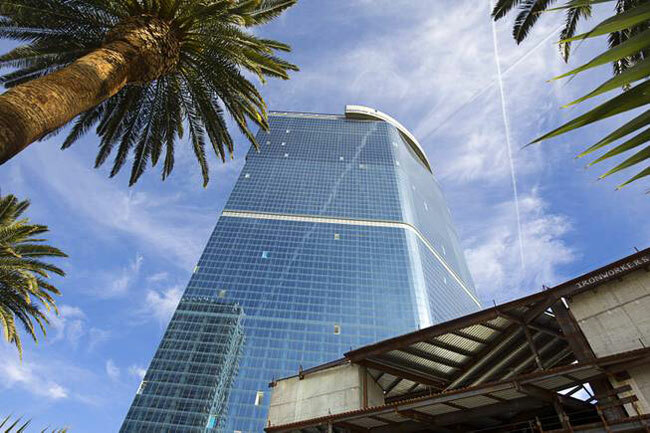 Located on the north end of the Strip, this 68-story resort-condo was supposed to have several nightclubs, more than 20 restaurants and lounges, a massive retail space and a 95,000-square-foot casino. The project went bankrupt in 2009, so Fontainebleau never opened. Billionaire Carl Icahn bought the property for $150 million the following year. Future plans for the building have yet to be determined. On a positive note, the exterior is already built. And since it’s one of the Strip’s tallest buildings, we’re crossing our fingers that it eventually turns into something. 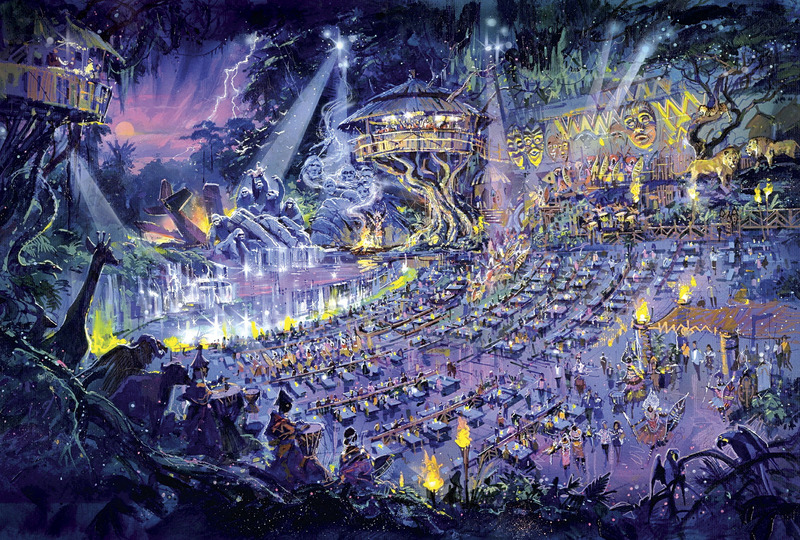 Rendering of Moon World Resorts. Photo from Blastr.com. Canadian entrepreneur Michael Henderson thought of an out-of-this-world idea in 2002. He envisioned a 250-acre resort complete with a lunar-themed aquatic center, a mall, a biosphere and even moon buggy rides. Other ideas included a crater pool with water slides, a glass underwater walking area, rock climbing wall, a bar with a two-story waterfall, a winter sports-themed area and a vineyard. We haven’t seen this side of the Moon yet but according to Syfy’s Blastr blog, Henderson predicts an opening (Vegas or elsewhere) in mid-2018. And completely unrelated, we did have our fair share of a Moon. Moon nightclub inside The Palms has an amazing retractable roof providing club goers with a cool breeze. Moon is only open for private events now. 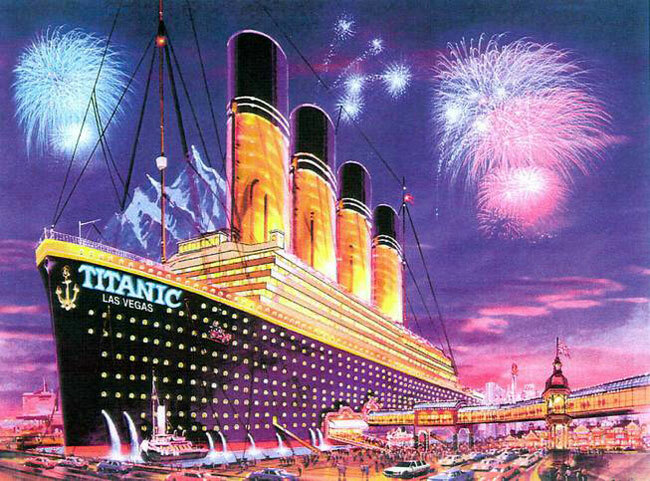 The idea for Titanic Las Vegas sailed off to oblivion. Photo from Las Vegas Sun. Inspired by the fateful RMS Titanic, this resort would have taken the shape of a 400-foot-long ship. Bob Stupak, Las Vegas businessman and creator of The Stratosphere, presented the idea in 1999 — not long after the hit movie. It would have stood 400-plus feet high — twice the height of the RMS Titanic. The hotel was going to have giant icebergs that included a hotel and theater, an amusement park, a petting zoo and a nightclub (cleverly named) Club Icebreaker. Stupak originally wanted it across from SLS, but the City Council rejected the idea. He then tried to rezone it near Las Vegas and Charleston boulevards but due to residential concerns, that didn’t work out either. Rendering of Xanadu. Photo courtesy of VEGAS INC. Even though we’re not talking about Olivia Newton-John’s eclectic 1980 musical film, Xanadu hotel is just as colorful. Planned in the 1970s, Xanadu would have been the Strip’s first mega-resort. It would have stood on the southwest corner of Tropicana and Las Vegas Boulevard, where Excalibur stands today. The county approved the project, but construction was put to a halt after a dispute over sewer line installations. While the plan never flourished, the resort planned to have many hotel features ahead of its time. This included a tropical theme, a water fixture with dancing flames and a 20-story atrium. These ideas were epic, especially for 40 years ago. These concepts are seen sprinkled in various parts of the Strip — we’ll leave it up to you to discover where. Echelon rendering. Photo courtesy of Las Vegas Weekly. Echelon Place was supposed to be on the north end of the Strip, where Stardust used to stand. Construction ceased due to the 2008 recession. It would have had a 140,000-square-foot casino, a 300,000-square-foot shopping venue, a 4,000-seat production show theater and a 1,500-seat theater for touring acts. In 2013, Boyd Gaming sold the project for $350 million to the Genting Group. It’s going to be Resort World Las Vegas, an Asian-themed resort slated to open in late 2018. 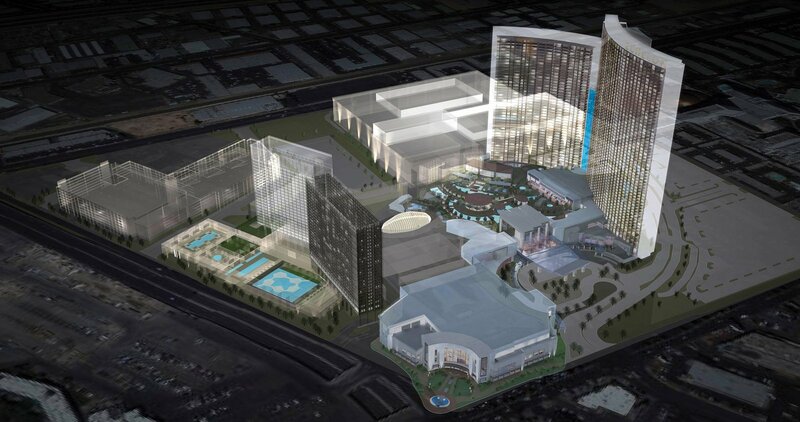 Resort World Las Vegas will have 3,000 hotel rooms, as well as 3,500 table games and slot machines. This Crown rendering kind of reminds us of a rocket ship. Photo from VegasTodayAndTomorrow.com. 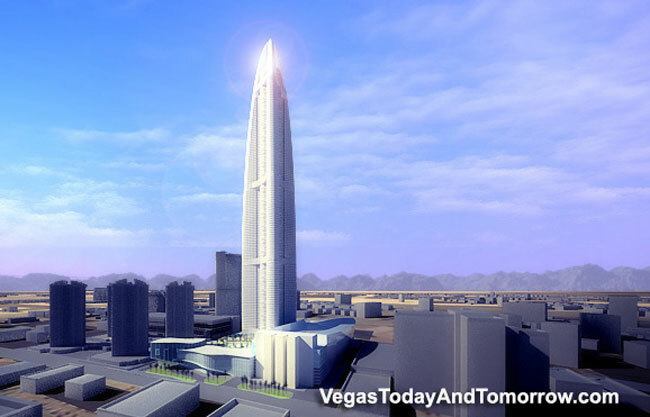 If this resort opened, it would have been twice the height of the Stratosphere tower. It stood 1,888 feet tall — a whopping 142 stories — making it the tallest building in the Western Hemisphere. It would have taken over the former Wet ‘n Wild site, right behind SLS. The project was too much of a financial risk, so the idea got canned in 2008. Rendering of London Resort and Casino. Photo courtesy of Las Vegas Sun. 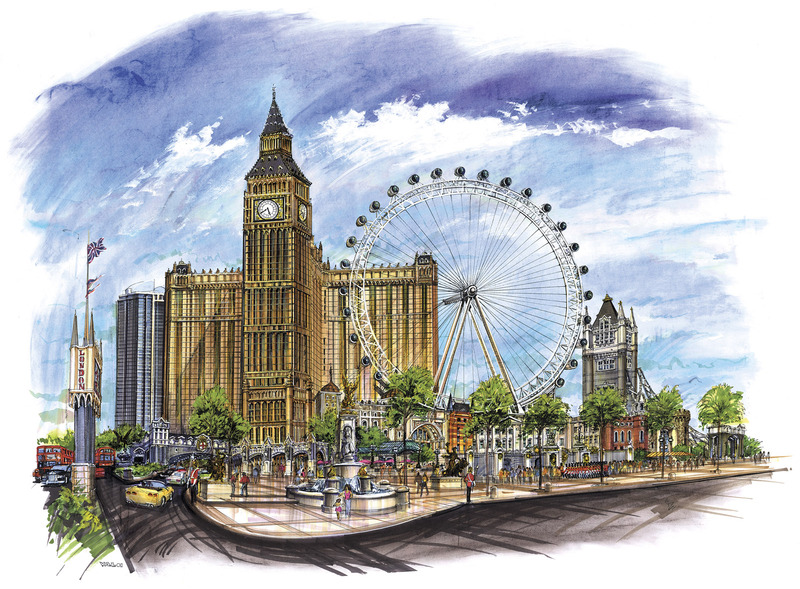 The 535-foot-tall London Resort and Casino planned to feature a Big Ben and Tower Bridge replica, along with 2,000-plus rooms, a 90,000-square-foot casino and an observation wheel. It would have either stood across from Luxor or in Fontainebleau’s location. Las Vegas was also supposed to have a $700 million San Francisco-themed resort called City by the Bay. According to this Las Vegas Sun article, City by the Bay planned to include popular landmarks like Alcatraz Island, Fisherman’s Wharf, Golden Gate Bridge and even an Oakland Bay Bridge leading into the Fashion Show mall. It would have had 2,500 rooms, a 120,000-square-foot casino and a San Francisco Bay replica complete with sea lions, boats and a wave-making machine. Today, Trump Towers takes up part of the proposed space. The proposed Desert Kingdom by Landmark Entertainment Group has a unique architectural style that combines African and Java-inspired elements. Photo courtesy of the Las Vegas Sun. The 34-acre Balinese-themed Desert Kingdom was supposed to open in 1997, complete with a 135,000-square-foot casino, nine restaurants and family-friendly attractions. 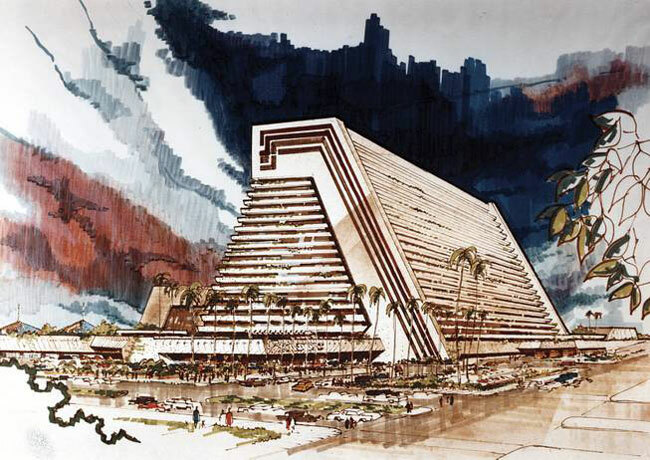 The resort also planned a $50 million expansion (to the defunct Desert Inn) by adding another hotel tower. The site is now Wynn Las Vegas. Star Trek hotel. Photo courtesy of Las Vegas Sun. These concepts were never executed, but how fun would Vegas be if these all succeeded? 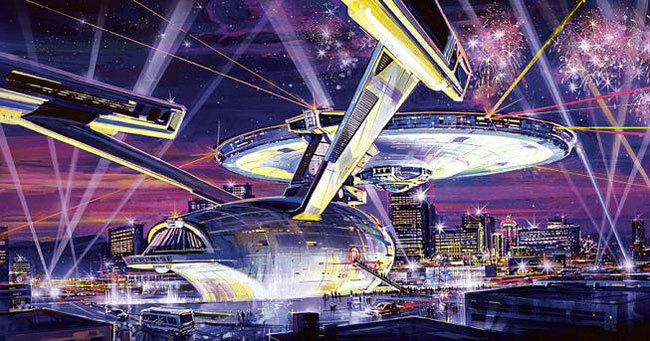 Star Trek Enterprise: In 1992, famous designer Gary Goddard wanted to build a full-scale version of the USS Enterprise in Downtown Las Vegas. Elvis: This $3.1 billion project south of Planet Hollywood was going to have 2,200-plus rooms and a 93,000-square-foot casino. Like Echelon Place, it got hit by the 2008 recession. Harley-Davidson: Bikers would appreciate the hotel towers shaped like exhaust pipes. WWF: We’re curious if it would have had bars or suites named after The Rock, Hulk Hogan or Stone Cold Steve Austin. Addam’s Family: Would they have someone dressed as Thing, chasing guests throughout the property? We have The Bank nightclub at Bellagio, but the “Oceans 13” hotel is completely make believe. But these two do have the Bellagio in common. While plenty of scenes were shot on the Warner Brothers set in Los Angeles, most of the shooting took place inside Bellagio’s executive offices. Additionally, the film also shot scenes at the airport and Mandalay Bay’s Mix Lounge. The Bank is named after Willy Bank, played by Al Pacino. The Bank would have been center Strip, at the actual Harley Davidson Café location. As slick as the hotel’s exterior and interior looked in the movie, both are just a Hollywood set. There is a shred of Vegas authenticity — the producers used real game tables and slot machines. This hit TV show starred well-known actors like James Caan, Josh Duhamel, Vanessa Marcil, Dean Cain and Tom Selleck. In addition to the all-star cast, the show had guest appearances like Jean-Claude Van Damme, Alec Baldwin, Brian Austin Green and Sylvester Stallone, among many others. Cameos included Las Vegas’ own Blue Man Group and Criss Angel, Snoop Dogg, Jon Bon Jovi, Duran Duran, Hugh Heffner, John Legend and Ne-Yo. “Las Vegas” gave us an inside look at a casino. Various job roles included a casino owner, president of operations, head of security, valet attendant, casino host, special events director, food and beverage manager and a concierge, among others. While this Vegas hotel didn’t exist, the show did shoot some episodes at Monte Carlo, Mandalay Bay and Green Valley Ranch, a popular local hangout. But the actual set was in – surprise! – California. This fake Chinese-themed Las Vegas hotel was shot on location at the former Desert Inn before it was demolished and turned into the $2.7 billion Wynn Las Vegas. The production team moved into the hotel to redesign parts of the property. They shined red lights on the hotel to give Red Dragon its scarlet color and painted and remodel the entrance and marquee. After filming (and to make way for Wynn Las Vegas), the Desert Inn was demolished in October 2001. If you remember the scene where Jackie Chan and Chris Tucker jumped from the hotel window and zoomed alongside the Chinese lanterns, then you also witnessed a legit car chase. This was not part of the movie; it actually almost hit crew members and extras. Luckily, no one was hurt and the police caught all those involved in the chase. Movie magic will soon become reality. While it may not be a red dragon per se, it’s a lucky one: Las Vegas will have a 2.5-acre Lucky Dragon hotel-casino. The $115 million boutique-sized property will have approximately 200 rooms, a casino and some restaurants. It will be located on Sahara Avenue near Las Vegas Boulevard, not too far from the popular Bonanza Gift Shop. Lucky Dragon is slated to open in 2016. These hotels may not exist, but you can still check out the fabulous ones that do.